Last night, I had the opportunity for a night out. My MOMS Club has a monthly book club that I've been trying to go to for a while now. So far it has never worked out, so when they were having a Christmas Party Book Swap, I jumped at the chance to go. As the date came closer, there were lots of things that came up that I easily could have used as an excuse. Chris was originally supposed to be home on time, but his work scheduled a holiday dinner on the same night. In the past I would have just cancelled, but this time I asked my mom to come watch Noah until Chris got home. And boy was last night freezing. Part of me just wanted to change into my pajamas and stay under a blanket. But I knew that once I was out that I was going to have a good time. The freezing temperatures did however persuade me to change my outfit last minute! 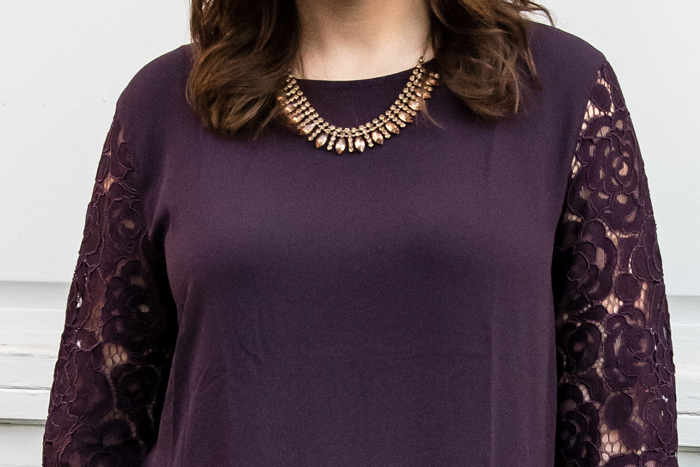 I had planned to wear this lacey top I'm sharing below, but decided instead to wear a warm sweater and my riding boots (with super warm socks). And thank goodness for my new remote starter. There's nothing I dread more than getting into a super cold car! And while I didn't wear this outfit last night, I have worn it out to dinner and hope to wear it to one of the many holiday gatherings we have planned. In my current stage of life, this is about as dressed up as I need to get around the holidays. Spouses aren't invited to Chris' work party, which means I'm only attending smaller gatherings at friends' homes. It's naturally a more casual event, but that doesn't mean I don't want to add some sparkle to feel a little more festive. Comfort is still key for me, so I chose my black jeans and a loose fitting peplum. But these lace sleeves make it go from ordinary to extraordinary. And I of course love the plum color! 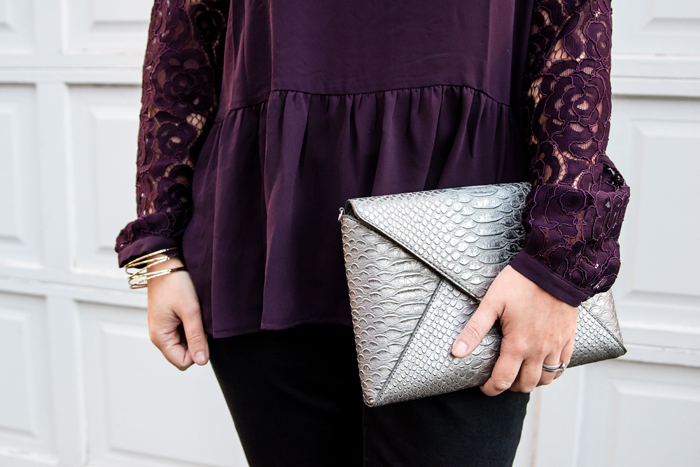 Some heeled booties, a necklace that sparkles, and a new clutch, and I'm set to go. I told you I had a fashion formula! And while I loved getting dressed up and spending the night out with friends, this is how you will often find me at night! 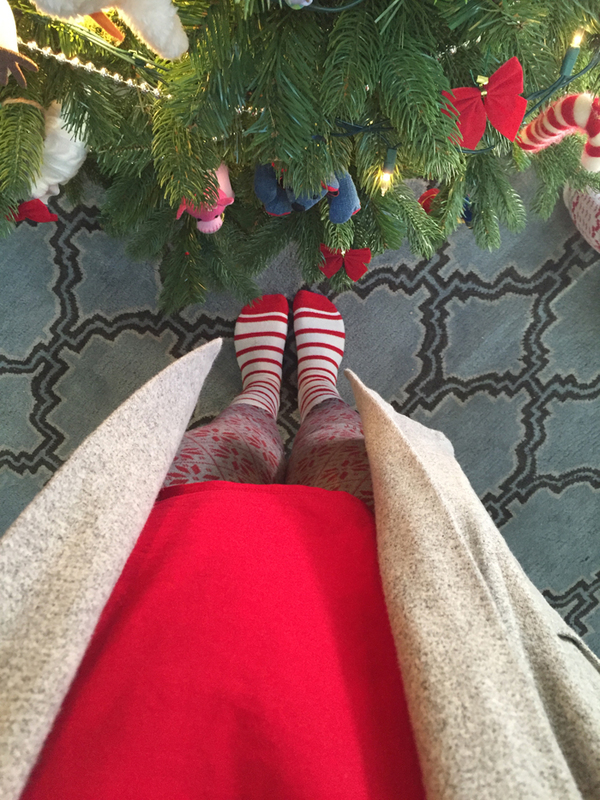 I am such a fan of leggings and especially love to get a few festive pairs to wear in December. And I've always been a fan of striped socks, so I had to get this set! I LOVE the lace detailing on that top!!! Seriously so gorgeous! I love that it's casual but dressy. Perfect for holiday parties! I love purple on you! I usually don't find myself picking that color but you rock it sister. I think of all the outfits I have seen you rock, this one has to be mu favorite. Its gorgeous! That purple/plum color is definitely your color. It looks so good on you! Adorable top.